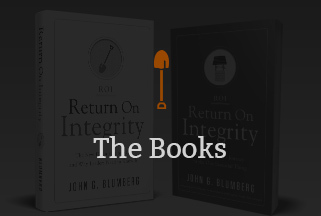 These tools included below are those referenced for use in the Return On Integrity book. 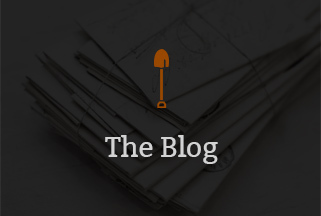 We hope you will revisit this TOOLS page to discover an ever-increasing supply of tools and best practices that will further equip and inspire the work you are doing in your organization. We would love to hear about your organization’s journey … and would appreciate learning of the tools and techniques you are creating and willing to share with others. 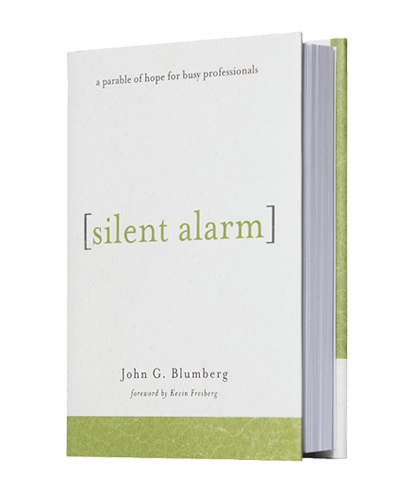 To share an idea, you can email John direct at John@BlumbergROI.com. 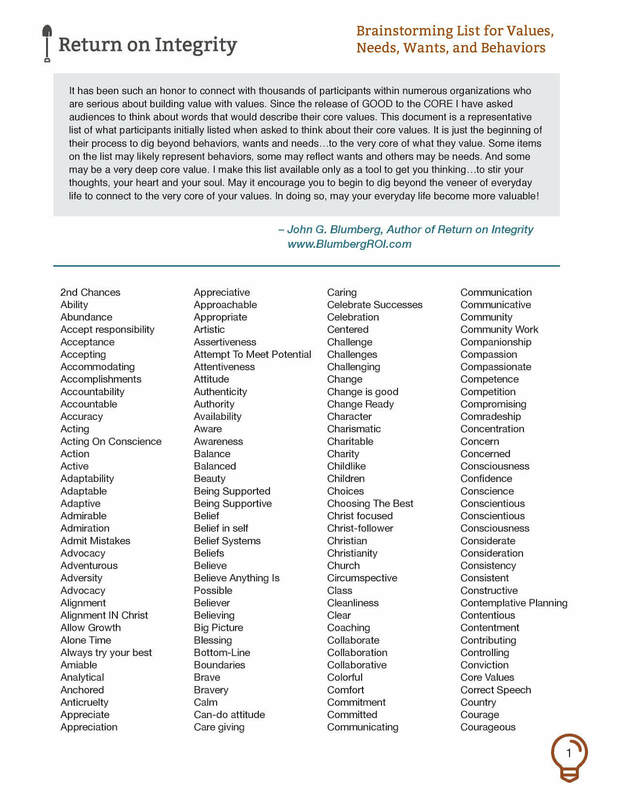 Over the years, I have asked audiences to brainstorm words that would describe their core values. This Core Values Brainstorming List is a compilation of what participants shared. It was just the beginning of their process to dig beyond behaviors, wants and needs … to the very core of what are their core values. As typical, many thoughts from their initial brainstorm best represent behaviors, some are wants and others are needs. And a few are core values. A blank sheet of paper is the best place to start. However, with their collective permission, I make this list available simply as a tool to get you thinking … to stir your thoughts, heart and soul … to encourage you to further expand your initial brainstorm. It’s where the digging begins! 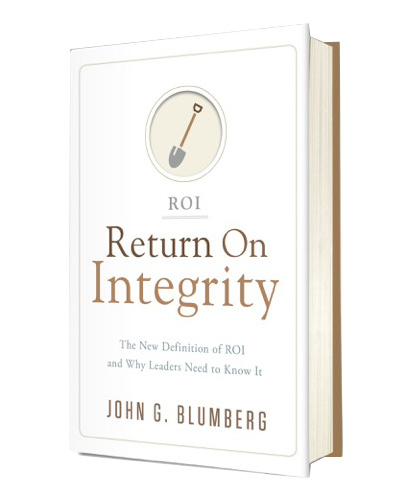 Connecting in community with other leaders-at-the-top who are focused on building their return on integrity can be beneficial on many levels – accountability, accessibility and sustainability. Forming a group of four top leaders actively planning to building their own ROI Destiny Roadmap would be ideal. 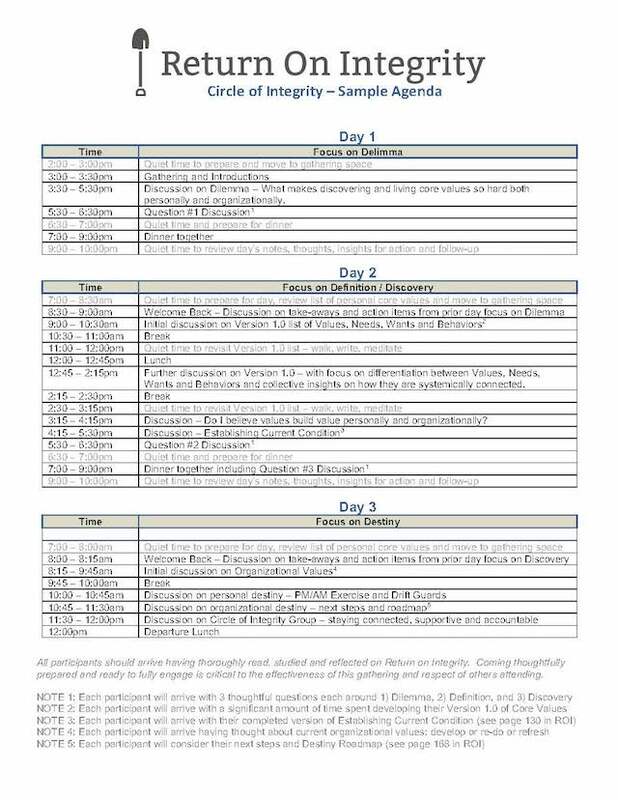 This sample agenda suggests the format of a 45-hour flow to make the most of your gathering. All participants should arrive having thoroughly read, studied and reflected on Return on Integrity. Coming thoughtfully prepared and ready to fully engage is critical to the effectiveness of this gathering and respect of others attending. 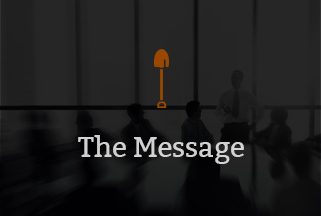 When it comes to core values, every organization has a current condition. Every organization has a set of core values, whether they are intentionally stated or established by an inevitable, unhealthy reverse flow. The first step on the organizational side of the equation is assessing, with brutal honesty, the current condition. This tool walks you through that process. 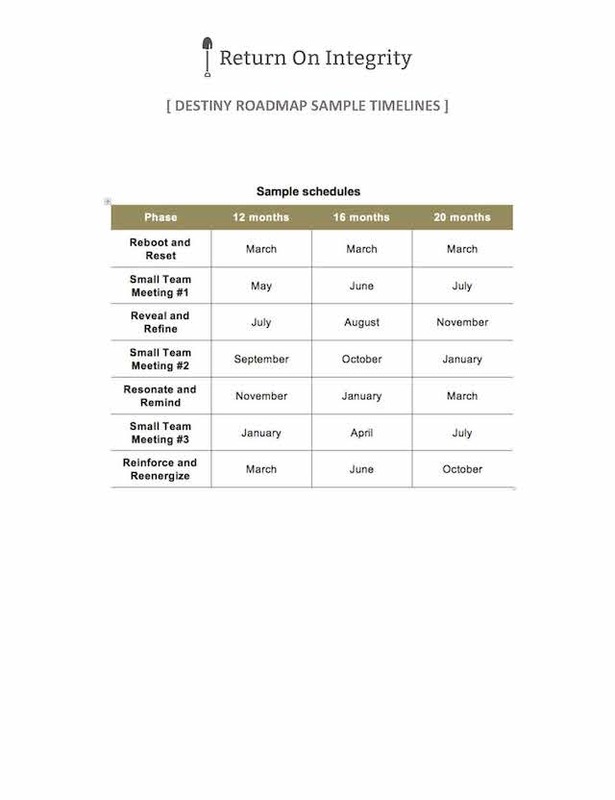 The Destiny Roadmap involves for key phases – Reboot & Reset, Reveal & Refine, Resonate & Remind, and Reinforce & Reenergize. This journey is made-up of a sequenced set of large group gatherings and small team meetings. You can easily stage the four phases as one phase per quarter. You can also let the process breathe and conduct the stages over sixteen to twenty months. This tool shows sample timelines. Whatever schedule you decide on, it’s preferable to set-up the entire schedule at the beginning. 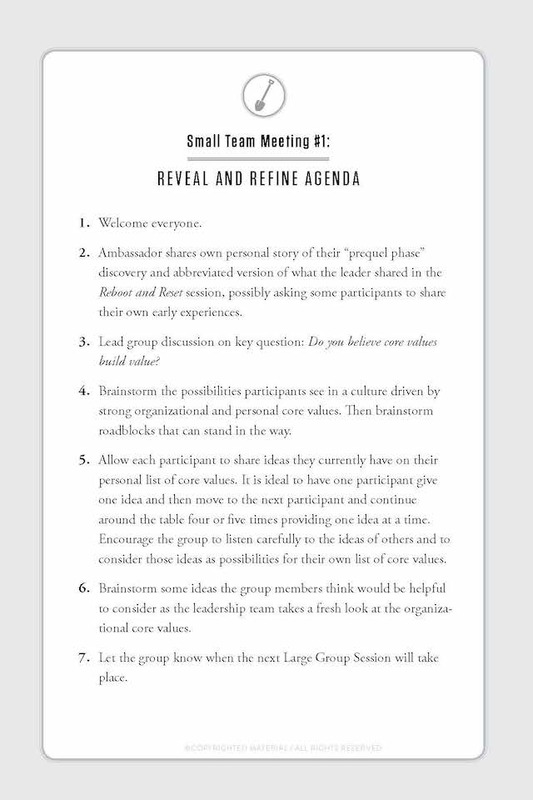 This is the suggested agenda for Small Team Meeting #1 as part of the Destiny Roadmap described in Return On Integrity. 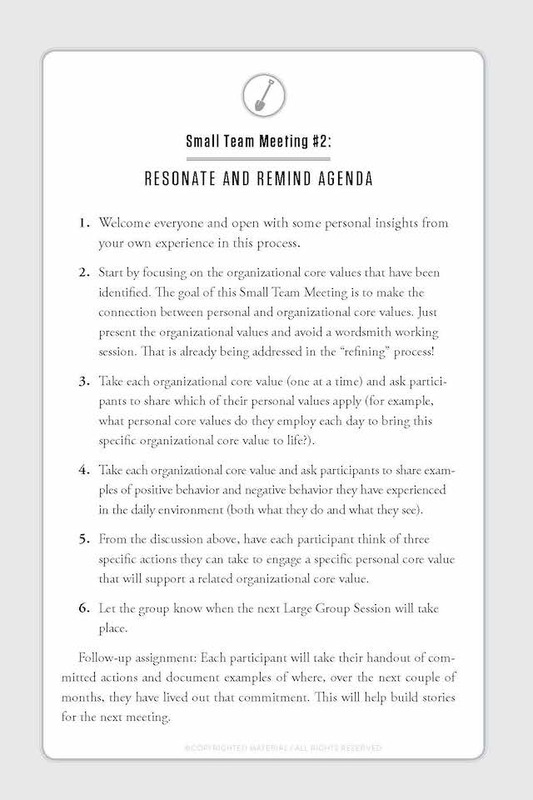 This is the suggested agenda for Small Team Meeting #2 as part of the Destiny Roadmap described in Return On Integrity. 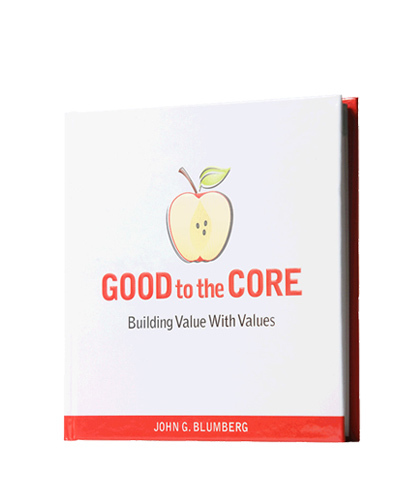 You can’t measure core values per se, but you can take the temperature of the collective perception. You might consider it more as taking your temperature. When we take the temperature of our body, the temperature is only one indicator of health. If you were to take your own temperature and notice a reading of 102 degrees, you would know that the temperature itself is not the problem, but rather is an indication that there is a problem. So too is the case with this Vital Signs survey. Vital Signs is intentionally designed to keep the focus on self and the inclusion of self when evaluating the broader organization. It’s to encourage self-awareness rather than judgment of others. It also helps bring forth a focus and a better understanding of the expression of values through behaviors. 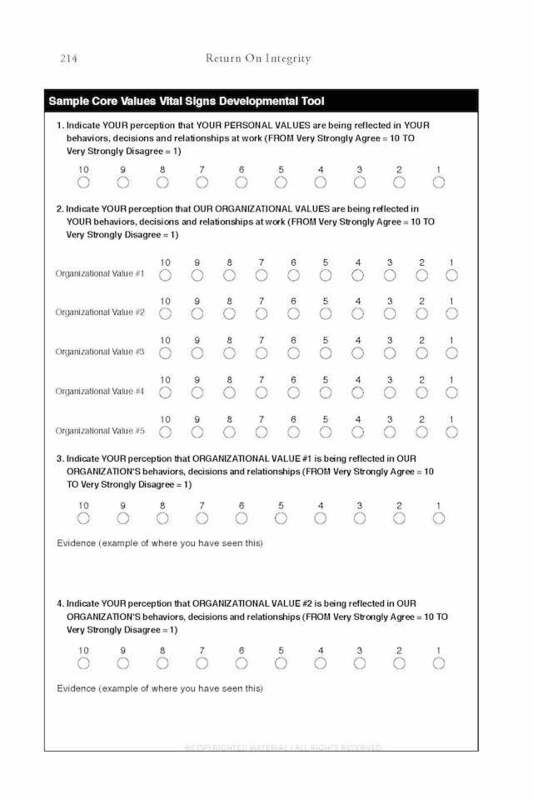 This is done through not only asking for numerical evaluations of organizational core values but also looking for evidence that supports the evaluation. This evidence is expressed in terms of observed behaviors that either reinforce a specific value or diminish it. 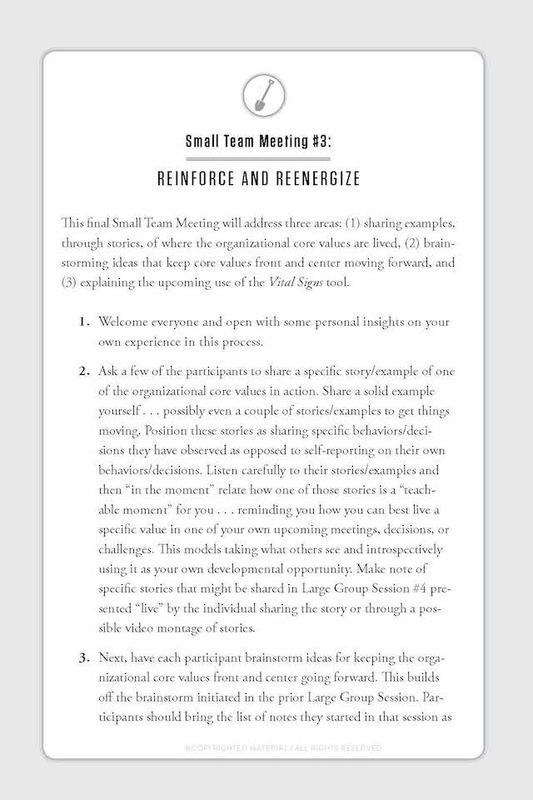 This is the suggested agenda for Small Team Meeting #3 as part of the Destiny Roadmap described in Return On Integrity.